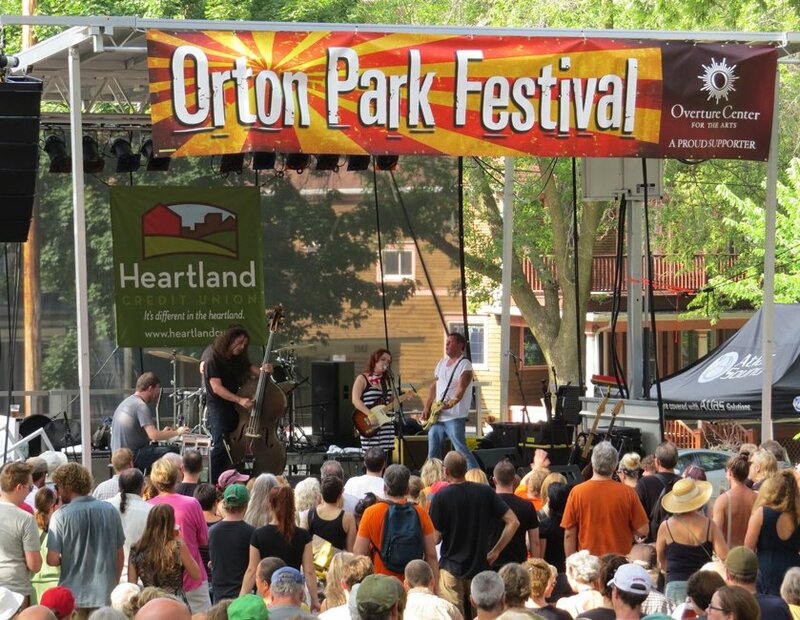 Lydia Loveless plays a late afternoon set at the 49th Orton Park Festival. 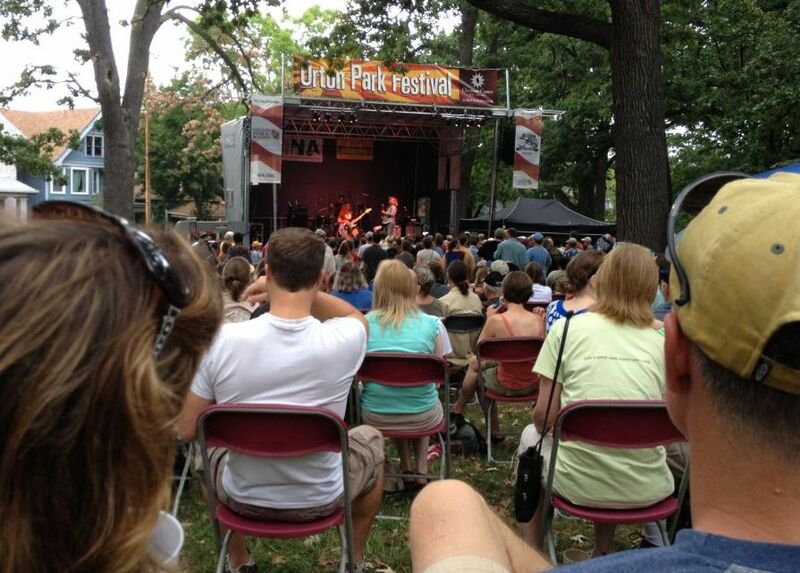 The Orton Park Festival was the same as just about every other year and to many that was just fine. After many wonderful years under the management of a few dedicated volunteers, the Marquette Neighborhood Association has spread out the roles in the past two years and guess what? No one noticed, and that is a good thing. From the music, to the food, to the activities, the festival was a familiar, comfortable and felt a bit more like the original picnic that started it all nearly five decades ago. While much did not change, at least one change did stand out a bit, the music did end much earlier but no one seemed to mind. The subtle changes will have their own review when the fundraising receipts are tallied; but we have tallied images that show that many had a great time, which is by far the most important benchmark. 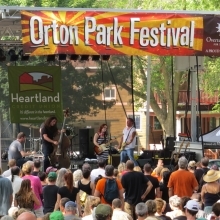 Anders Osborn during the 2012 Orton Park Festival. In its long history, Orton Park has had to survive many threats. In 1924 the City of Madison proposed a boulevard with a 12-foot median that would bisect the park. Proponents argued this would improve traffic flow from King Street to the Eastside following the recently opened Rutledge Street bridge across the Yahara. It seems that this route had become a very popular artery for “far” Eastsiders who wanted to avoid railroad crossings at Williamson Street and Atwood Avenue. The opposition to that project ninety years ago echoes the same reasons why today’s residents guard the tranquility of Madison’s oldest park: its too popular with children. The festival, begun in the middle 1960s, is in its 49th year and grew out of general neighborhood organizing against various development schemes and for neighborhood strength and cohesion. In the last days of spring, despite rabid stewardship over the years by park lovers including the Friends of Orton Park, Mother Nature also attempted to remake the land when an EF-1 tornado barreled through the Marquette neighborhood early on June 17. While some trees were lost, the park never lost face with even the fallen trees repurposed in a resourceful way. The near Eastside of Madison has it pretty good when it comes to food and resources: the Willy Street Co-op, copious amounts of restaurants, multi-faceted transportation options. The choices are so good that it has spurred Marquette Neighborhood Association President Michael Jacob to float the idea of MNA officially supporting a south side location for the proposed Public Market. 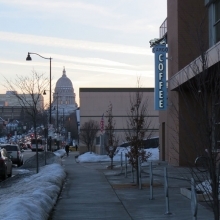 Recently, the City of Madison Local Food Committee recommended a site at the corner of East Washington Avenue and First Street, saying the location had the best combination of population density, high traffic volume and proximity to the now rapidly developing Capitol East Corridor. But some in Madison feel that the location doesn’t address the relative food deserts that exist on the north and south sides, two locations that were also considered by the committee. This sentiment led Jacob to propose, in an email to the neighborhood listserv, throwing MNA support behind the Park Street location. The long awaited Williamson Gateway Tree, created by metal artist Erica Koivunen with assistance from her husband welder and blacksmith Aaron Howard, began to take shape on the median of the 600 block of Williamson this morning (August 3). The 32-foot sculpture is a welding tour-de force involved both rough and finite touches from the trunk to the over 200 flowers that will form the canopy. Koivunen even included insects and birds throughout the tree. 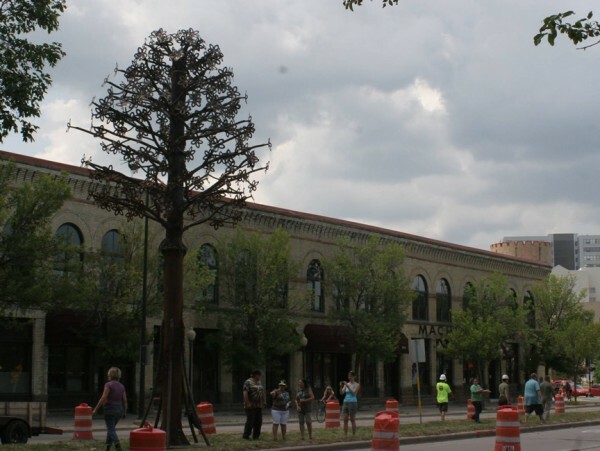 The $60,000 tree is one of several signature art projects forwarded by the MNA Arts & Culture Committee with support from several benefactors including the Madison Arts Commission. You can view the progress at the Williamson Gateway Tree Facebook page. 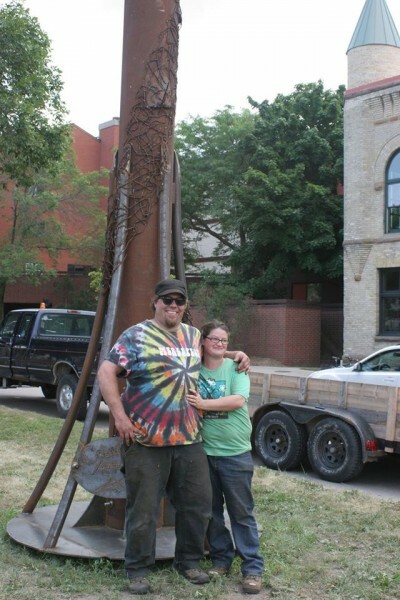 Sculpture artist Erica Koivunen with blacksmith and husband Aaron Howard.